TARAPOTO, Peru, May 3 2017 (IPS) - Corruption has penetrated the Amazon rainforest like an illness that infects everything, said Ruben Siqueira, coordinator of the Pastoral Land Commission (CPT), during the VIII Panamazonic Social Forum (FOSPA), which brought together in the Peruvian Amazon jungle representatives of civil society from eight Amazon basin countries. 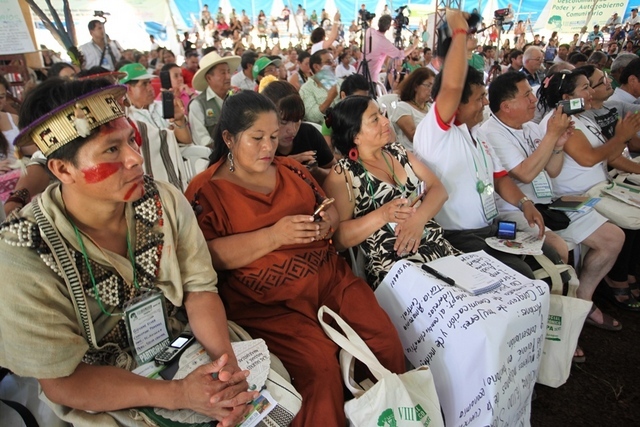 The forum, which drew more than 1,600 participants to Tarapoto, capital of the department of San Martín in northern Peru, ended on the afternoon of May 1st with 24 proposals to protect the forests, water, lands and rights of the region’s indigenous peoples. The agreement emerged from the debates held April 28-May 1 in nine working groups, which focused on denouncing corruption and the social, environmental and economic impact of the works carried out by the Brazilian companies investigated in the Lava Jato operation. “FOSPA’s proposals and conclusions will be presented to the relevant decision-making authorities of the different state bodies of each country,” one of the event’s organisers, Ismael Vega, executive director of the Peruvian Amazon Center of Anthropology and Practical Application (CAAAP), told IPS. The Lava Jato investigation was launched in Brazil three years ago. The case has connections with a dozen countries in Latin America and Africa, where the Odebrecht construction giant and other Brazilian companies paid huge bribes to high-level public officials to win public works contracts, many of them in the Amazon region. The bribes were paid for works in the following countries: Angola, Argentina, Brazil, Colombia, Dominican Republic, Ecuador, Guatemala, Mexico, Panama, Peru, Mozambique and Venezuela. Odebrecht executives confessed to paying nearly 800 million dollars in bribes for contracts in these countries between 2001 and 2016, which brought them three billion dollars in earnings, according to a December 2016 report by the United States Department of Justice. The list includes five of the eight Amazon basin countries. During the forum in Tarapoto, representatives of social movements, indigenous organisations and researchers from these countries agreed to collectively report and fight the corruption. These are Brazil, Colombia, Ecuador, Peru and Venezuela, that make up the Amazon basin together with Bolivia, Guyana, Suriname, and the French Guiana territory, which is also part of FOSPA and whose representatives were present in Tarapoto. In Peru, where inquiries conducted by the local public prosecutor’s office present the greatest progress after Brazil, the South Interoceanic highway is being built, connecting this country with Brazil from the Pacific to the Atlantic ocean, running across the Amazon and Andes regions. Odebrecht executives admitted to paying at least 20 million dollars in bribes to win the contract for the highway during the government of former president Alejandro Toledo (2001-2006) And Peru’s Public Prosecutor’s office is still investigating illegal payments by another Brazilian company, Camargo Correa, for the same construction project. “The corruption is systematic: it is present in the construction of megaprojects, in the extraction of timber with fake identifications and certificates, in extractive industries projects, and in the laws that favour these investments,” Ruben Siqueira, the coordinator of the Brazilian catholic CPT, told IPS. Siqueira and other Latin American representatives emphasised the alarming numbers of killings of environmental activists. The CPT reported that 61 activists were murdered in 2016 in Brazil, including 47 from the Amazon region. Olga Suárez, from the Colombian association Minga, also denounced the murder of environmental activists in her country, and said investigations into these cases in Colombia’s Public Prosecutor’s office can take up to 25 years. “There is too much delay and impunity,” she told IPS. They also called upon the states to “set aside their religious precepts when passing laws and deciding the public policies that affect” women’s rights, bodies and land. The recognition of indigenous people’s collective rights, and of their ancestral knowledge, was another focal point of the agreements reached. In the same vein, they demanded that the states defend the knowledge of community elders, and respect and recognise the ideas of children and young people with regard to the protection of nature. In parallel to the Forums’ working groups, nearly 200 young people gathered in the municipality of Lamas, half an hour from Tarapoto, to explore the many areas affected by pollution and learn about the experiences of local communities in protecting the forests and water sources. 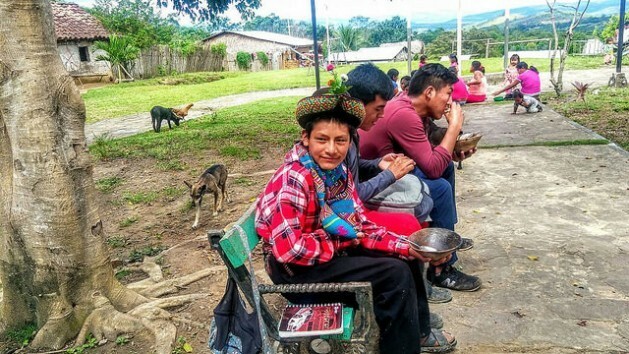 Among the adolescents who arrived from various regions of Peru was 13-year-old Jhanmarco Flores Humaní, a member of the Quechua community from the Andean department of Ayacucho in southern Peru, one of the regions hardest hit during the years of Peru’s 1980-2000 civil war. Jhanmarco makes dams to create ponds from rainwater in periods of drought. He is the president of a network of young people from the town of Quispillacta, in the department of Ayacucho. “The Apu (the mountain spirit, in Quechua) talks to me, it tells me in my dreams how to protect natural pools of water and how to create lagoons,” Jhanmarco told IPS, on his first tour through the Amazon region, to which he hopes to return someday.